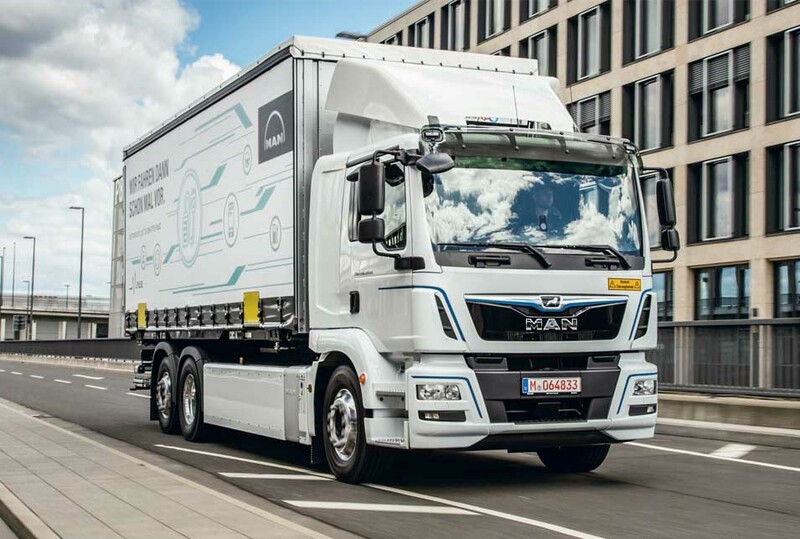 With its impressive vehicles, MAN provided straightforward answers to complex questions about e-mobility and digitalization in 2018. Customer focus, enthusiasm for the product and efficiency are the core values at MAN. In the past fiscal year, the company put the MAN eTGM distribution truck on the road and presented the eTGE van as a series-produced vehicle. Both vehicles are designed for urban use. The long-established, Munich-based company is using them to provide straightforward answers to multiple complex questions surrounding e-mobility and digitalization: The models are fully electric-powered and emission-free, and therefore contribute to improving urban air quality. Their low noise level also enables increased use at night. MAN is taking one step further with the MAN CitE concept, an electric-powered truck full of creative solutions for urban delivery traffic. Its innovative equipment, including the 360-degree camera system, means drivers can work safely and comfortably day in, day out. The CitE has a range of up to 100 km – more than enough for deliveries in cities. From its bus range, MAN presented the MAN Lion’s City E prototype, which is close to production. Its batteries are crash-safe and located on the roof to save space. They enable a range of up to 270 km. In 2018, MAN also presented new tailor-made solutions from MAN DigitalServices. In South America, MAN Commercial Vehicles, through its Volkswagen Caminhões e Ônibus brand, recorded rising demand in the reporting year, driven by the improved economic environment. In Europe, demand was up, too. Orders received increased by 22.2% to 146 thousand vehicles. MAN delivered 137 (114) thousand commercial vehicles to customers in the past fiscal year, of which 14 (11) thousand were buses. MAN produced a total of 138 (116) thousand commercial vehicles in 2018, including 14 (11) thousand buses. Incoming orders in the Power Engineering Business Area amounted to €4.0 (3.7) billion despite the continued difficult situation in the shipping industry and economic difficulties in emerging markets. Driven by higher volumes, sales revenue at MAN Commercial Vehicles climbed to €12.1 billion in 2018, exceeding the prior-year figure by 9.2%. As a result of the expenditure associated with the restructuring activities in India, operating profit declined to €332 (362) million. The operating return on sales was 2.7 (3.3)%. In the power engineering segment, MAN recorded an increase in sales revenue to €3.6 (3.3) billion. The operating profit for 2018 was €193 (193) million; positive volume effects were offset by a deterioration in the mix. The operating return on sales stood at 5.3 (5.9)%.